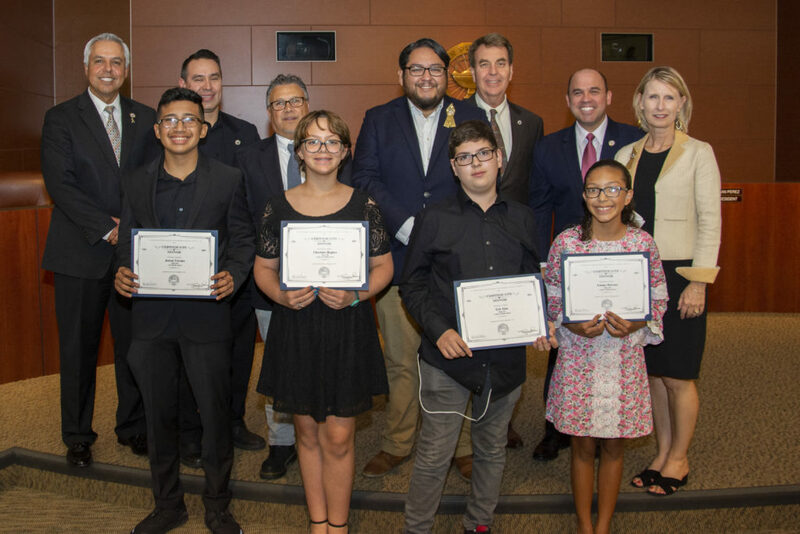 During their regular meeting held Sept. 11, Harlingen CISD’s Board of Trustees recognized seven middle-school students who proved they have the smarts to compete with college-bound seniors. These students earned state recognition and qualified for Duke University Talent Identification Program’s prestigious 7th Grade Talent Search. These students earned scores that are approximately equal to the 50th national percentile rank for college-bound seniors taking the tests. Only about 35 percent of the students who participate in the Duke TIP program reach this level. Each year, Duke TIP identifies a group of academically talented students in the United States based on their exceptional grade-level standardized test scores. Only those who score at or above the 95th percentile qualify. For middle-schoolers, this testing opportunity allows them greater insight into their academic abilities. They also gain valuable benefits and have access to unique resources for gifted students. Duke TIP is a nonprofit organization dedicated to serving academically gifted and talented students. Duke TIP works with students, their families, and educators to identify, recognize, challenge, engage, and help students reach their highest potential.